Meet my new-to-me floor loom! At Madrona in 2010, I was very tempted to buy a Schact Baby Wolf that was for sale used, but I just couldn’t take the plunge. Well, this year at Madrona I was going around unabashedly staring at all the weavers and wishing I too could have a floor loom. I was jealous. I was curious. And, strangely, it paid off. 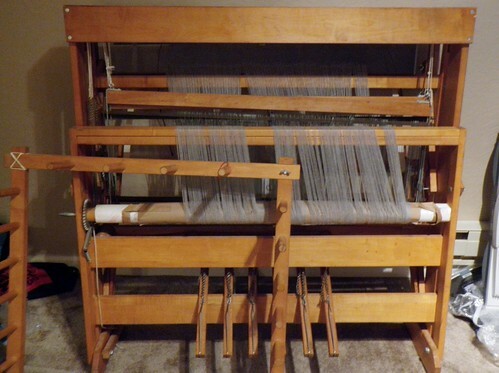 I was chatting with someone who had just bought a flip loom, and after a bit of weaving talk I learned that she had a floor loom that needed a new home. She actually lives quite close to me, and after a bit of talking and some planning to find a vehicle large enough (the loom needed a new home due to space issues, it is pretty large!) it was all arranged and this afternoon I brought home my loom. Pre-warped, so I can even weave a bit without having to do the hardest part… at least right away. I am so excited to really learn how to weave! I did use an inkle loom quite a bit in a middle school art class, and there was the little attempt with the table loom a few years back, but it seems like I might actually get my sock yarn leftover scarf done sometime soon after all! Saturday after posting the Happy Birthday to MJ, I set out with my fellow Salem knitters and went on a yarn crawl in the Eugene area. First we went to Ben Franklin, where I wasn’t inspired to buy anything. They had a very nice selection of sock yarns, but most of them were things I had already. We went on to The Knit Shop which was really a nice store. They had a pretty decent selection of sock yarn (and a really great selection of lots of other stuff, but I’m not really an “other stuff” knitter). I wanted to get some Panda Wool, but none of the colors really appealed to me so I restrained myself. Next we hit Soft Horizons where I found some Zauberball. This is a strange stripey yarn rolled into a rather lopsided ball – and in beautiful blues. I also couldn’t resist a skein of Dream In Color Smooshy in Some Summer Sky. So pretty! I’ve been trying to pick semisolids or very lightly variegated yarn when I buy now, since I like to knit more complex patterns but don’t like it when they don’t show up. Our last stop was Fiber Nooks and Crannies. They had a lovely store with lots of yarn and a small selection of spinning fiber. A huge amount of Koigu too! And a nice selection of sock yarn including some beautiful Arucania stuff that sadly had silk. I would have bought it otherwise. It was a lot of fun to hang out with all the knitters, and nice to see so many new shops too. I wove! 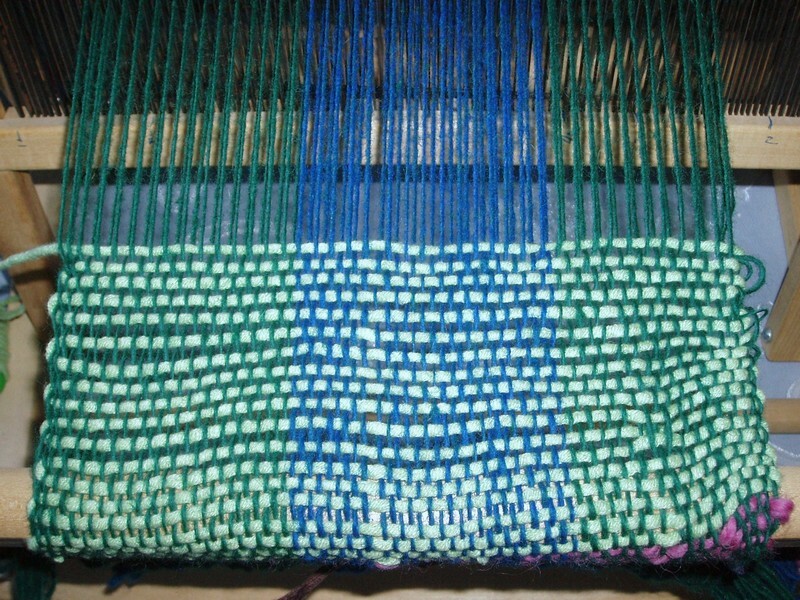 After reading a book about weaving and doing a little experimentation with the loom – I had to figure out how to tie the heddles so they would move – I started a little practice weaving with the warp that was already there and some random scraps of yarn. The tension is really uneven since I was too lazy to tie the warp on properly and it’s been sitting on there for upwards of 15 years, so I think it’s slipped sideways a bit. Also there were a couple of strings missing, you can see a thicker band of stitches (?) towards the middle. I think I will go ahead with my sock yarn project, provided I can figure out how to warp the loom. And I’ve also discovered, already, that two heddles is not enough. With two you can only do a plain or “tabby” weave. That’s what I wanted for my sock yarn scarf anyway, but if I was going to get into weaving I would want to be able to do stuff that was a little more complicated. I think I would definitely want at least a 4 heddle loom.